The 62 metre Feadship Sea Owl, which had her technical launch in June, has been delivered to her owners in a special ceremony at Amsterdam’s famed Maritime Museum. She features exterior styling and interior design by London-based Andrew Winch Designs, who also designed the owner’s previous yacht, the 43m Sea Owl built by Burger. 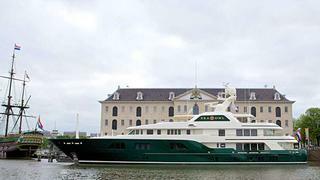 Like the owner’s previous yachts, she features a green hull, which Feadship is calling ‘jade-mist green’, and an off-white superstructure. Her exterior is detailed in varnished teak wood and stainless steel. As the yacht is designed to suit the family-oriented owner, Sea Owl also boasts myriad games, toys and themed areas for younger guests. There are two dedicated children’s cabins on board sleeping four children and a nanny cabin. Further accommodations include the owner’s stateroom and three guest suites. Eighteen crew are accommodated in eight twin-size cabins, plus a captain’s cabin and a chief engineer’s cabin.